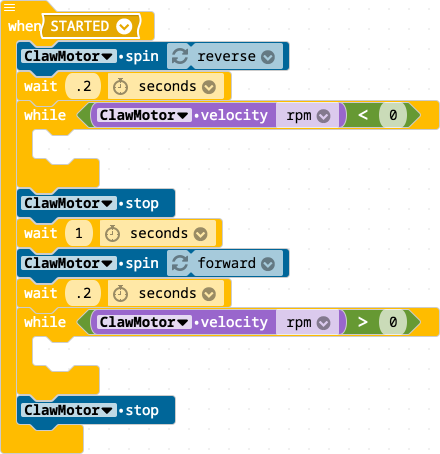 This example program shows how to program the V5 Clawbot to open and close its claw using Modkit. A V5 Smart Motor, on Port 3, named ClawMotor. Then the program will pause for two-tenths of a second ( .2 seconds) to allow the motor to start spinning. Next, the program will pause for 1 second. Finally, the spin block, while loop, and stop block are repeated, but spinning forward. Spinning the claw motor in the opposite direction will make the claw jaws close. When the claw's motion is resisted, the loop will finish and the motor will stop.